Bob Dylan's record company beats the big drum this fall. The first eight Dylan albums are retrieved from the old master tapes and restored by all rules of the art. They are now released in mono on CD and vinyl - and a package including both. At the same time, Dylan releases a new chapter in his Bootleg Series. This time historical recordings from 1962 to 1964 - the so-called Witmark demos. They are pure acoustic recordings with guitar, harmonica and sometimes piano. Total of 47 tracks, including fifteen never-before-released. The witmark demos documents an artist in the frantic development. All the songs are recorded before the man was 24 It starts with demo recordings of classic traditional tunes and ends with classics like "Blowin 'In The Wind", "The Times They Are A Changin'," Masters of War "and the drug influenced, but yet so poetic" Mr. Tambourine Man. " In all, there is a wealth of offerings that include packages with all the releases, on CD, vinyl, both CD and vinyl t-shirts, posters, bonus CDs, etc. 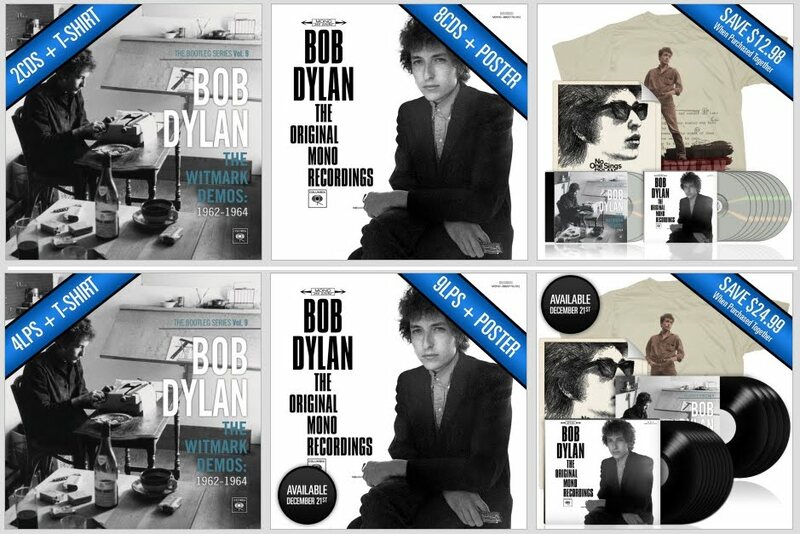 At Bobdylan.com there are six different products. If you include the bonus CDs, the number of product combinations are more than ten. It's expensive to be a Dylan fan and Sony Music have really understood how MP3 ghost should be avoided by developing must have products for fans. It can of course be the question of whether such major initiatives like this are worth the money. Personally, I think the Witmark demos are the highlight. Sony Music has over time developed the knowledge on “how to” extract good sound from old master tapes. Witmark demos is not an exception. We meet a early version of rough and tough acoustic Dylan. Yet the digging so deep in the archive, is perhaps more for special interests than for the general public. Some of the tracks hold such a bad recording quality; technically they just appear to be bootlegs. On the other hand, there are tracs that fully demonstrates the complete Dylan was as an artist in 1964. It's pretty obvious that he had to develop a new musical direction. In 1964 he was at complete and perfect acoustic artist. In many ways he is the Picasso of music. Mono releases, be it the Beatles or Dylan, is a new experience for stereo grownups. But the differences are quite marginal. It's a little more punch, a little less sense of space and a more logically sound. On the pure acoustic songs the voice and guitar are coming from the same point. I must however admit that the difference between the original CD releases and stereo remaster editions, released a few years ago is more stunning than the difference between the remaster and mono versions. On the other hand, the mono releases are true to original releases as they were meant to be. Therefore, they have a documentary value. They are now in my shelf and hence Sony Music has succeeded to sell the same old material to me at least five times. No matter. The mono box contains two of the ten best releases of all time according to Rolling Stone. It feels good to listen to the masterpieces "Blonde on Blonde" and "Highway 61" in mono - as they were released. The six others are masterpieces as well, so the box is worth buying. The brand new Elvis album: "Viva Elvis"